You have to see it to believe it. Driving through India was like one of those Crazy Taxi driving video games, where there’s always something, or someone, in the road that you have to swerve around, and where the terrain is like a roller coaster. It’s both terrifying and fascinating at the same time. First, a disclaimer about these photographs. Most were taken from my seat behind the driver of the van. I learned how to use the “quick shot” setting on my camera, but even that didn’t always allow me to focus at the same time as I was bouncing up and down and back and forth. It was all I could do to brace myself so I wouldn’t be thrown onto the floor of the van. Even so, nothing could stop me from photographing the incredible and improbable sights on the road. The trip from Jodhpur to Narlai should have taken three hours…it took more than five. Between the condition of the roads, and the obstacles in our way, it wasn’t too surprising. I’m not complaining…it was captivating! I still can’t believe there weren’t any casualties…those cows wait until the last possible nanosecond to move out of the way. Let’s not forget about the people…how many miles must these people walk with their bundles on their heads and herds of cows? Let me tell you, there are some long stretches of nothingness. Compare and contrast to what we are familiar with: This is the toll booth. Just kidding, of course, but don’t you love the juxtaposition? This is the vantage point from inside the motorized rickshaw I took back to the hotel in Jaipur one day. I was hanging on for dear life, so it’s a miracle I got even one photo. Even crazier than the bumpy roads full of cows were these roads from Agra to Delhi. 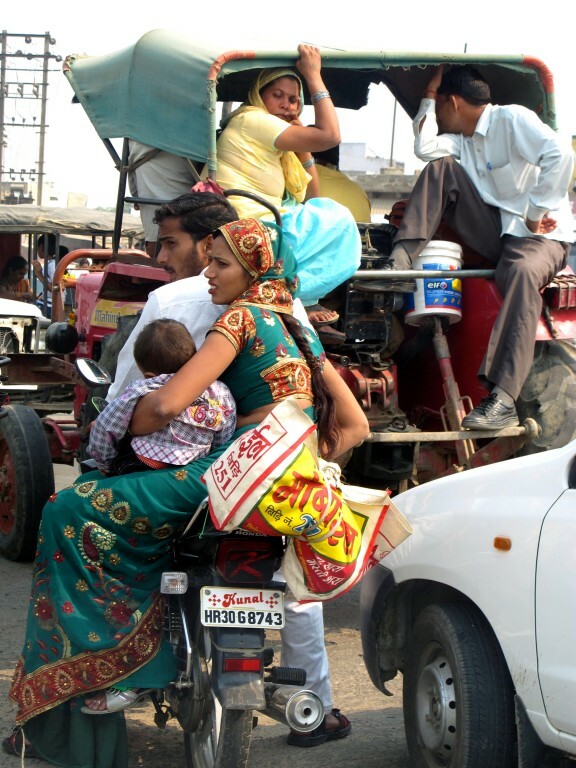 Whole families were on motorcycles, women riding side saddle and holding children in their laps. People hung off the back of rickshaws and sat on top of buses. On the dashboard of the van is a small figurine of the Hindu god, Ganesha…a fitting talisman for a drive in India. Because, you see, Ganesha bestows blessings to remove obstacles. thank you Pam for the great trip! Your picture journey is feeding my soul Pam. Fabulous -Thank you I have tried to leave a message before and it hasn’t gone through – hope it does this time. ps/ what is with the men on the motorcycles being the only ones wearing helmets?! Amazing pictures! Thank you for taking me on that interesting ride!